Intel finally joined the 21st Century by unveiling the first smartphone running on their silicon, the Lenovo K800. Powered by a Intel Atom Z2460 running at 1.6GHz, the phone features a full 720p display and dazzled most everyone who saw it in action despite having only one processing core. Any other company entering the Android fray by showing of a Chinese market-only device running Android 2.3 would be delcared D.O.A. But Intel’s got like a gabillion dollars in their war chest, and 2.3 at CES will likely be 4.x by the time the K800 ships, so don’t count this Silicon Valley giant out of the mobile wars just yet. I continue to be amazed – and totally freaked out – by the prospect of 3D printers entering consumers’ homes. Backed by online design communities, Makerbot and 3D Systems both debuted “No Assembly Required!” 3D printers at the show. Sure $1,300+ to “print” single color doodads is a bit steep, but imagine what we’ll be able to do three years from now if the technology takes off. This is the stuff of sci-fi novels and bad cable TV shows, and it’s real. You and we and Jon all fell hard for Samsung’s Galaxy Note smartphone and its gargantuan 5.3-inch display. Yet Apple’s iPhone and it’s relatively tiny 3.5″ screen continue to rule the school of cool. Who knows what this year will bring when it comes to mobile display size trends. The giant wave of not-so-awesome that is 3D TV has done nothing for me. I finally have a 1080p panel in my living room but barely ever make full use of its pixels, thanks to the cheap convenience of streaming Netflix and free OTA 720p broadcasts. So I expected to be entirely underwhelmed by CES’ HDTV offerings. I was wrong. LG and Samsung’s 55-inch OLED sets were jaw-droppingly beautiful to behold. 4K resolution is hyper-real to the point of creepiness. And Samsung’s ES 8000 line manages to sneak a webcam into its bezel without sacrificing its beautiful, barely-there industrial design. I want a Nokia Lumia 900 in Cyan. Why? Because it looks cool. HTC’s Titan 2 offers more screen and megapixels, and Samsung’s Focus S is thinner, lighter, and sitting on my desk right now. But neither is crafted from smoothly rounded and sharply edged polycarbonate dyed Pantone blue through and through. It’s 2012 and everyone’s specs are so good that they’re beginning to differentiate in terms of the objects themselves. Parrot AR Drone 2.0, TechnoBuffalo Editors’ Choice Winner, CES 2012. First thing Mike Perlman did when our team gathered in Sin City? Took away my camcorder and lent me a Nikon p7100 for the week. Suddenly I was able to take quality stills as well as TechnoBuffalo-worthy 720p video, all in a pocketable form factor simple enough to be Noah-proof. I may not be ready for a DSLR, but I think it might be time to step up to something Perlman/Quach approved. Canon’s new PowerShot GX1 has giant image sensor and a vari-angle LCD so I can look at myself while filming, so that might just be the ticket. Enough with the lawsuits, it’s time to rewrite our copyright laws. But first, send everyone involved in the legislative process to the booths way out on the fringes of North Hall and the iLounge Pavilion at CES. Check out all of the endlessly replicated speaker dock and accessory designs, and then figure out patent laws that make sense for the 21st Century. I’m not saying stealing is right, but I am saying everybody does it. I’m pretty sure today’s “Our customers don’t really like Windows Phone” talk is spin control on Sprint’s part. The fact of the matter is they’re getting hammered by everyone from Metro PCS to AT&T when it comes to next-gen network rollout. Microsoft reps told me they have no plans to make Windows Phone work with WiMax. Sprint said they won’t be pushing out any new WiMax devices. Both camps cited the same rationale: LTE is the future. It’s true: WiMax has been a giant fail for The Now Network, and judging from their share price and CES performance alike, neither the long-awaited Sprint iPhone nor AT&T’s failed bid for T-Mobile will be enough to save Dan Hesse’s company. Sprint’s in trouble. Big tr0uble. 10. 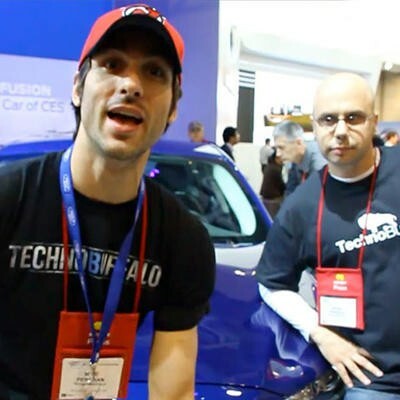 Three Buffalos + One Camera + One Insanely Hot Car Model = Excellent Adventure! cf. #5 above. Everywhere I went last week I saw 6th Gen nanos strapped to people’s watches. Sure, I was at a geek fair, but I suddenly saw the appeal of one of these things out in the real world. Interchangeable straps, people, inter-change-able straps! I think I have an old nano lying around here somewhere. I hope it’s eligible for the recall program. If it is, I’m buying this in green. Or orange. Or both. Somehow I was able to sleep three hours, roll out of bed, and work 14 hour days (spent mainly on my feet), all week long in Sin City. I drank a lot of coffee, and tried an energy shot (ick), but so what: I’m far too old to work that much and sleep that little without being a cranky, brain dead shell of myself. And yet, I pulled it off! I was cranky here and there, but I still pulled it off. But now that I’m back home in Oakland? Seven hours of shuteye and I woke up more tired than when I went to bed. I think I need to look into getting casino-grade oxygen pumped into my house.